Introducing the Bunny lounge: Special Edition. This chromatic update to one of Bend's classic Lounge Chair designs introduces new colors never before used in our line. The Bunny lounge can be used in both indoor and outdoor settings while its streamlined shape makes this chair perfect for both traditional and contemporary spaces. This piece is available in Black, Night Blue, Olive Green, Mint, Grey, Grapefruit, Telemagenta and Eggplant. Please message us with your choice of color before you place your order by using the "Ask the Seller" feature. If you don't see the color you are interested in, please let us know and we can assist with your request. This piece is also available in stainless steel and metallic finishes. Our pieces have intricate designs not only for aesthetics, but also for utility. We do have padding options available which are also by request. Please message us regarding pricing and colors. We use a galvanization process, which means the iron frame is zinc coated before it is powder coated, adding an extra layer of durability. All of our pieces are outfitted with glides to prevent friction with the ground. Our pieces are comprised of intricate wire patterns formed through a method of hand shaping and spot welding. We refer to this process as "bending" Each bend is carefully made to achieve the utmost structural support, while the angles of the back, the curvature of the seat and the distance between the wires are designed to promote comfort at utility. When anyone sits in our pieces, the first thing we typically hear is "Wow, this is so comfortable!" The wires are welded close together so that every chair has unique strength and comfort. Bend Goods is a furniture design house based in Los Angeles, CA committed to creating furniture and accessories that are practical and long lasting while still exciting and fun. Founded in 2010 by Gaurav Nanda, Bend is based on his passion for making functional objects with sculptural design qualities. The Michigan born entrepreneur spent many childhood Winters vacationing with his family in the Palm Springs, California sunshine. He credits these trips with immersing him in the world of Mid-century modern architecture, design and lifestyle. Those things would later influence him to leave his corporate job as a Vehicle Sculptor at General Motors and put his stamp on the era of design that had inspired him for so long. The quality of our products is in the details: the inviting shapes, the sparks of color, the ease of assembly, and the packaging all make for a product that is unforgettable. Each element of our designs embody Bend's passion for making pieces that elaborate rather than basic. These details are combined with our building materials of hot-dipped galvanized iron and powder coated finishes to produce an updated take on vintage furniture styling and construction. The contemporary look and feel is perfect for any modern home, but is versatile enough to fit into a even the most traditional of spaces. Rare to find with the original pads, this lounge chair is in excellent condition. Pads are amazingly in great condition also. 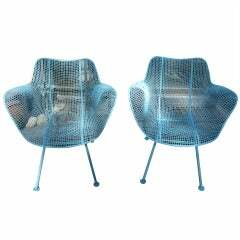 Pair of Mid-Century Modern style of Franco Albini bamboo or rattan lounge chairs. Classic Mid-Century Modern design.